Colchester United caretaker manager Kit Symons has confirmed he will not be part of the new set-up at the League One club under Paul Lambert. 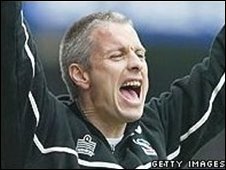 Lambert, who succeeded Geraint Williams on Thursday, has appointed Wycombe coach Ian Culverhouse as his assistant. "I'm leaving the club and heading off to look for a new challenge elsewhere. It's how football works," Symons told BBC Radio Wales. The clubs have agreed a small compensation package for Culverhouse. Former Wales international Symons arrived at Layer Road in January as Williams' number two. But the sacking of his fellow Welshman last month has forced the 37-year-old ex-Portsmouth, Manchester City, Fulham and Crystal Palace defender to look elsewhere. "A new manager comes in and often wants to bring his own people in," said Symons. "And I have no problem with that." Saturday's game at Cheltenham will be Symons' fifth in caretaker charge. After starting with a 4-3 win at Tranmere, successive home defeats by League One leaders Leicester City and Bristol Rovers effectively ended any hopes he had of being given the job. But 20th-placed Colchester returned to winning ways in the Johnstone's Paint Trophy on Tuesday night. Symons will hope to bow out on a winning note against the team just one place below them in the League One table.